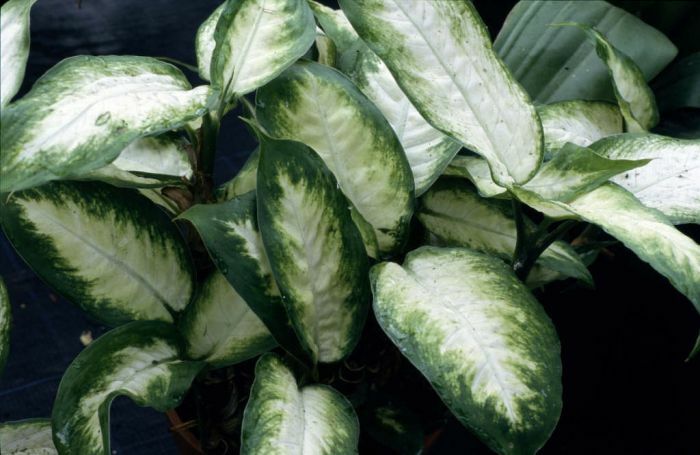 Dieffenbachia — also known as the dumb cane plant — is one of the top ten most popular houseplants out there. It’s easy to care for and has beautiful variegated green and white foliage. 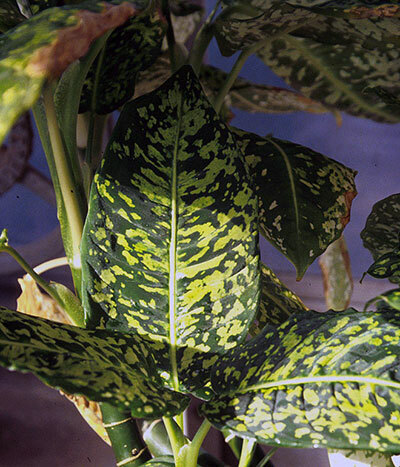 In this guide, we’ll cover the dieffenbachia plant from A to Z – it’s care, propagation, pests, diseases, and common problems. Fertilizer Feed in the growing season at half strength every month or so. If left unpruned, the plant will resemble a palm tree. It’s a perennial plant and most cultivars have white speckles on the leaves, though not all cultivars have this feature. The name “dumb cane” comes from the fact that the plant’s leaves contain raphides, which can poison you and leave you unable to speak for a period of time. ‘Camille’ is one of the most popular cultivars out there and probably the one you’ll see at a garden center. It’s well-known for the deep-cream color that fills the middle of each leaf. It prefers more shade than most types of dieffenbachias. ‘Tropic Snow’ grows very tall at over 6′ tall. The leaves are similar to ‘Camille’, but less consistently cream-colored in the middle. 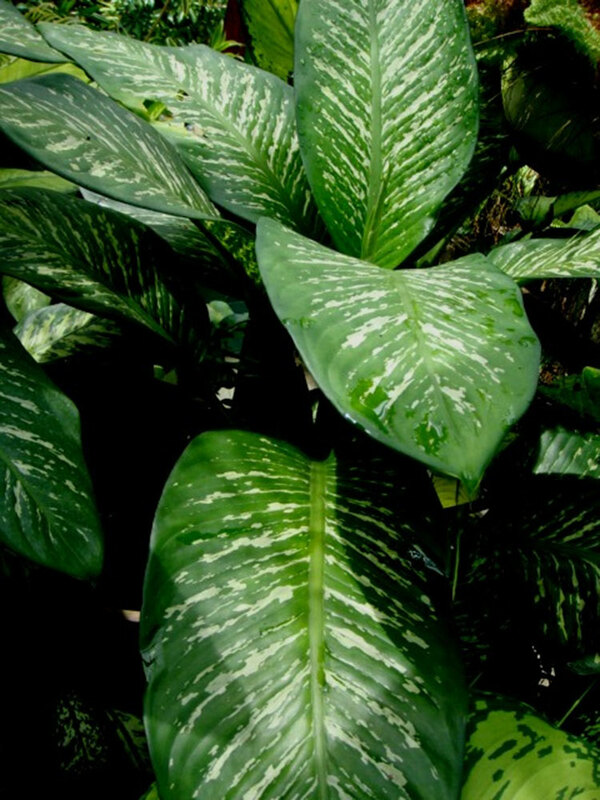 ‘Tropical Tiki’ is one of the biggest dumb cane plants at 2-5′ tall and 3-5′ wide. 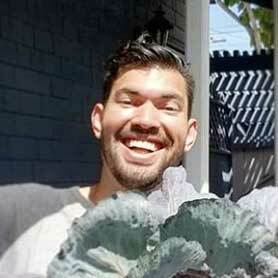 Its leaves are silver, cream, and green and heavily variegated. It’s one of the coolest looking dieffenbachia plants out there. ‘Hilo’ is different from the cultivars mentioned above due to its lime green variegation mixed in with dark green base color. The only white found on this type is in the veins of the plant. 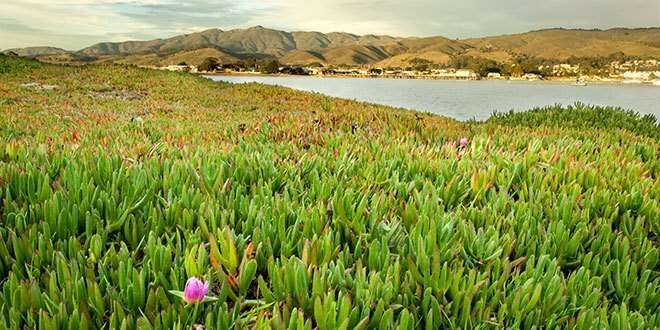 It grows more upright at 4′ tall and just 1-2′ wide. Most dumb cane plants prefer a medium to bright light source. This means they shouldn’t be exposed to direct light, but will thrive 2-5′ away from a windowsill. Some cultivars prefer even less light, like ‘Camille’. You can get away with placing dieffenbachia in pretty low-light situations. The best way to water your dumbcane is to let it get moderately dry and then completely drench the soil. Keep in mind you can only use this method if you have a drainage hole in your pot. 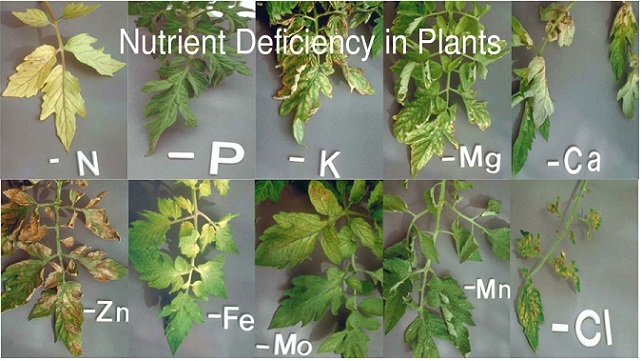 Without one you risk causing root rot and killing your plant. 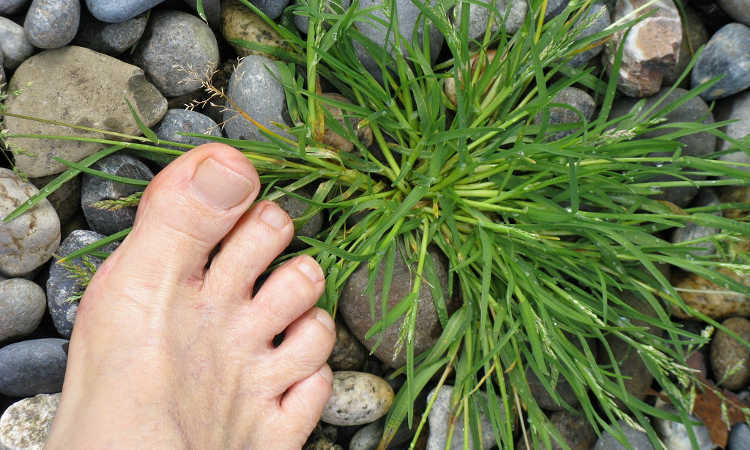 Let the soil dry to at least 1″ before you repeat the process and never let the soil get bone dry. 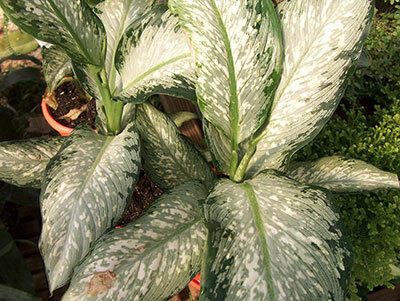 Like many houseplants, dieffenbachia plants need a soil that retain some water but also drain well. If you get a standard potting soil it may pack too tightly and drown out the roots, so mix in perlite or coarse sand to add aeration. Dumb cane loves being fed at least twice a month. Use a high quality houseplant fertilizer, but make sure it doesn’t have lime. Depending on the size of your dieffenbachia, it may need to be re-potted as it grows. If you decide to re-pot, do it right as winter ends and the growing season is about to start. Although it’s not necessary to prune your dumb cane, you may want to trim it a bit to keep it under control. ​There are three ways you can propagate your dieffenbachia: air layering, suckers, and stem cuttings. It can be done at any time of the year. 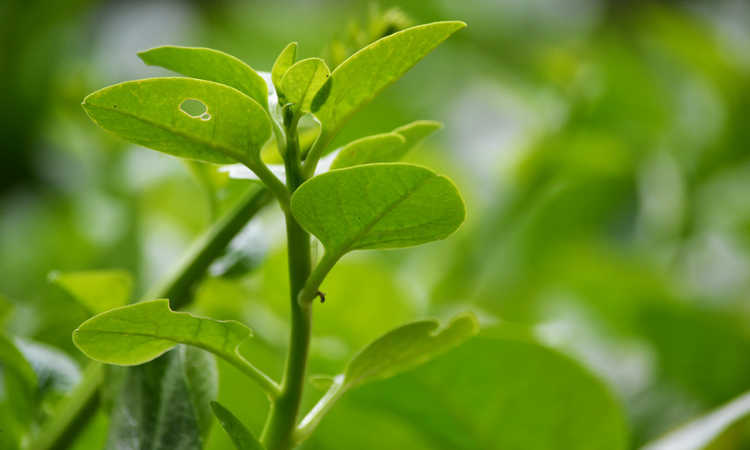 You can propagate directly from stem cuttings as long as the stem has a section where new leaves and stems will grow on it. 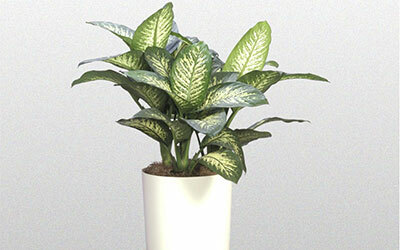 Overall, the dieffenbachia plant is a hardy houseplant that’s easy to grow. There are a few types of bacteria that can attack the plant and decimate it, so be on the watch for these. It’s also garnered controversy due to its toxicity for humans and pets alike, but as long as you’re careful you shouldn’t have any problems having it in your home. According to the ASPCA, dieffenbachia is toxic to both cats and dogs. ​The leaves contain calcium oxalate crystals that will irritate their mouths and prevent them from performing many normal functions like swallowing. Dumbcane is poisonous to humans as well. Ingestion can cause the mouth and throat to burn and swell. In severe cases the swelling can block airways resulting in suffocation. The classic pests that affect most houseplants can also affect your dieffenbachia: mealybugs, spider mites, and aphids. For all of these bugs, you can try to wipe them off with a cotton swab doused in rubbing alcohol. That’s an effective tactic if you catch the infestation early. You can also try washing your plant’s leaves off in water, knocking them all off. You may need to do this 3-4 times to be sure you got everything. While each of these diseases has their own presentation, symptoms, and prevention, there are some general rules that will prevent you from ever dealing with any of them. Q. My dumb cane plant was doing fine, but now the leaves are yellowing and there are dry spots on the leaves? A. Over time, soil breaks down and there is less aeration for the roots. If you’ve had your dieffenbachia for a while, you may want to repot with fresh soil and check the roots for signs of damage. A. Go back to the basics — give it bright light, keep the soil dry, increase humidity with misting, and keep away from hot spots. Q. Can I root cuttings of my dieffenbachia in water? A. For the most part, dumb cane plants don’t root well in water. They do much better with air layering or by putting cuttings in a potting soil with a lot of peat moss. My plant was knocked to the ground and has some bent damaged leaves. They are dying slowly. Should I trim them off? Scared it will look bare. Will the leaves grow back? If they’re damaged to the point of broken, they’re not going to grow back so I’d prune them off and wait for new growth to come out! Well, I did the complete “No, No”! Not knowing better, overwatered! Plant was so beautiful; was watering from bottom thinking plant would only “drink” what it needed. Beautiful plant at bestie, next morning basically dead! I”ve cut it back but what else should I do? Yes, I realize it’s easier to purchase a new one but I really want to save this plant! All comments appreciated! Oh no! Yeah, your best bet is to refresh the soil. Dump it out of the pot, hose off the roots and cut away anything rotten or dying. Then, repot with fresh soil and make sure not to over water! Can dumb canes be grown in a garden in New York City? Yup, you should be all set in those conditions Noel! 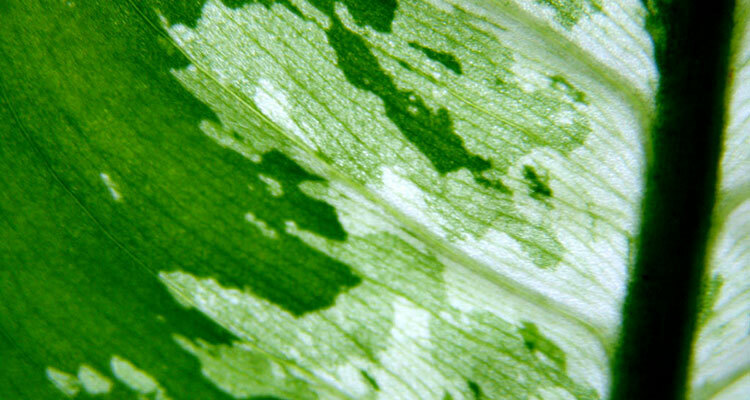 I have always had my Dieffenbachia growing in water, I have noticed that the edge of the leaves are browning. what can it be turning the leaves? I want to put in soil, but not sure if the plant continue to grow since it’s always been in water. Best way is a full repotting and soil refresh. Cut away any dead root tissue and cut away an equal amount of foliage so the remaining roots can support the plant! My diffenbachia is over 12 years old and 10 feet tall. Probably taller if i didnt have a ceiling..The largest leaves are as long as my arm and it grows these buds every so often that look almost like a skinny ere of corn at first then open slightly over time. It has a yellow long seedy looking bud inside that sometimes turns a purplish then dries up. I wonder if these buds that only started appearing after 10 years have any medicinal properties or benefits…does anyone know what these even are? I have a dumb cane plant, I believe of the “snow” variety that was stuck outside while we were out of town during a cold snap. The leaves are now almost squishy. I know the leaves are goners but, is there any chance the plant will come back from it? I’d take off all of the damaged plant tissue, give it perfect growing conditions, and hope that the roots survived! My daughter gave me a fairly large Dumb cane (two splash). I followed the plant growers on You Tube in caring for my plant. I noticed the leaves began to drop tears from the edges of the leaves; then the leaves began to develop dark spots which dried out and became holes. I have re-potted the plant, sprayed the leaves with Neem and warm water, rinsed the soil by pouring it through with warm water twice, sprayed the leaves with baking soda and water but to no avail. The leaves still develop the dark spots which dry out and become holes in the plant. Nothing I have tried has helped my plant. Does anyone have any suggestions? Please email me janjdavis@aol.com. Thanks. The only thing I can think of is potentially overwatering – dumbcane will “cry” water when it is overwatered, which could then cause weakening of plant tissue causing the holes you’re talking about, Jan. I put my Dieffenbachia Tropic Snow (I think), which was fairly well grown to about 3′ above the top of the pot, when I put it outside in direct San Francisco late summer/early fall sunlight and wind, which left it sunburned. I cut away the leaves that were the most damaged, which means I’ve got lots of stems and few leaves. If I keep it inside, will it quickly regrow or would an extreme pruning help—cutting back the mostly bare stems, and if so, how far down? Anytime I’ve had to cut it down, I’ve removed 100% of the damaged leaves to the base. I cut back stems that don’t have any leaves on them to support photosynthesis as well. That may mean severely cutting back your Tropic Snow and hoping it comes back. Good luck Paul! I have a plant and when I got it the leaves were very large. The longer I have the plant the smaller the leaves become. WHY???? That is common as the plant grows to it’s maximum! Thank you……..But this is a fairly new plant. Well it was started from cuttings. Once my plants get to a certain height, I just cut them off, repot and keep it moving. I’ve not ever had a problem. I plan to do that again within the next week or so. Mine are touching my ceilings again. Smart idea. You’ll have an entire army! I have had several Dumcane’s and the problem has been that they get top heavy and can’t stand on their own. The one I currently have is about to reach that point and I was wondering if there’s a plant prop that can accomodate a Dumcane’s height and diameter. I appreciate your imput. My Dumbcane plant has 3 stocks to it and 2 of them are about 5 feet tall and have a problem standing on their own. Recently repotted it thinking that a bigger pot would help but the stocks are just too heavy to stand on their own anymore any suggestion? I have a lot of dumbcanes when they grow too big I slice the plant off at the base n stick it in water n they root good. When I went to water my big dumbcane bush /tree I noticed this white growth it almost looks like a flower…my question is….what is it? I think I have one of these plants from my inlaws. They thought it was a palm, but It matches almost every discription of this plant and nothing of the palm. The only thing that doesn’t seem to fit is the poisoneous part. My cats have eaten entire leaves (on more than one occasion) with no side effects. I admit I’ve even ingested some after pruning some tattered leaves and forgetting to wash my hands, and I had no problems either. Anna. I noticed in your post that you mentioned that you bought these plants. I’m not sure that everyone will agree with me on this, but whenever I purchase any plant from the store I have a basic rule of thumb which is to repot the plant into a larger pot. I’ve noticed for some reason that my purchased plants tend to be nearly rootbound which will ultimately wind up killing the plant if not corrected before it’s too late. Watering, fertilizing and providing the ideal place for a plant are all key elements to maintaining heathy plants, however it’s also very important to pay attention to many other things as well. My mother Gave me a start of this plant four years ago. She simply started it in water. I potted it in her back yard and brought it home. It’s now more then a foot taller then the plant she started it from which is two years older then the one I have and much brighter and more pleasant to the eye. I keep it near a window in a room with a good ammount of light, but not in the direct sun. The plant tends to make dramatic turns toward the sun so I turn it when this happens to keep the stalks from bending too much. These plants love corners and look beautiful in them. Make sure they are getting proper drainage and listen to them when they tell you something is wrong. Anytime that the plant gets too tall it can be cut off. The removed sections can be rooted in water to create new plants. If you want to be able to keep an eye on them, root them in a clear vase or pot so you can see when the roots begin to grow. Once the roots are well established you can plant it in soil. Hi, Does anybody know how to get a leopard lily to flower? I’ve had mine for a couple of years and it just seems to be getting bigger rather than flowering. I’ve re-potted it once and it had a big growth spurt then, it has started spouting new stems so it’s getting fuller, but no flowers. It’s in a good size pot (with no drainage holes at the bottom) is this the reason? or perhaps the soil? Mine didn’t flower for years, I was really surprised. The flowers are kind of blah and then their gone, doesnt really add anything to the plant. hello, im pat and i have several dumbcane plants BUT i have noticed that the leaves have white powdery stuff on them i clean them with a soft cloth but a day or two the white stuff comes back and i notice little bugs i tried using the sprays for killing the bugs but it also kills my plants as well, i have lost several plants due to that i love this plant i dont want to loose any of them can someone help me??? I would not have this plant in my house after finding out how poisonous it really is. I touched the dry, dead leaves to remove them and was working on supper at the same time. Not washing my hands, I ate a carrot and immediately started experiencing burning and swelling. What if one of my grandbabies had touched a leaf? It’s gone! Sorry if there are those of you that will defend this house plant but it doesn’t belong anywhere near small children, animals, nor adults. I never receive my answer about dumb cane care i have brought over 20 they last a while and soon leave me.i probably let them dry out before watering and they droop and started getting pale and fading. please help me. A week ago my plant started to have dry, yellow leaves and I’ve noticed small black bugs on the leaves. How should I treat the leaves? Thanks! i tasted the dumb cane…. i did not know wat the plant was but i only had it in my mouth. yeah it was stupid but i experienced swelling and severe mouth watering. i ran my mouth under tap water for a few minutes and sponged my tounge. after a while the pain was gone. i do not recommend to eath or digest this plant in any way. hope this helps for anyone desperately looking for a cure at four in the monring. My dumb cane is about 6′ tall when standing upright. The leaves aren’t growing from the base, only about 3′ from the top. and the stalk is very tall it is bending over. I don’t understand air laying too well. can i cut the stalk down and replant the cane in water to grow new roots or can i put in another potted soil? I received a dumb cane cutting from a friend approximately 12 years ago. I potted the plant and it growed slowly when I lived in VA. At one point I left the plant with a friend who placed it on a patio where it got flooded with water after a long rainy spell. There was one leave and the stalk when I got the plant back after I moved to FL. Approximately 6 months after I moved to FL and placed the plant in my sunroom it grew from a skinny stalk my friend told me to throw away to a thriving 8 ft plant. I’ve grown 10 plants from this one in the 3 years since I moved here! I’ve even given some away. I love the plant and its beautiful (all of them)! I have a dumb cane that my friend gave to me. It’s about 6′ tall when standing upright. The leaves aren’t growing from the base, only about 3′ from the top. Because it is so tall it has a tendency to bend over. I know that supporting it will help, but i am not too sure if i need to replant it. It’s a very healthy plant, and i’m nervous to replant it. Apart from killing people, what other positive way can the poison be used? Anything in excess is poisonous. Pesticide? Insecticide? Mosquito poison? Cancer therapy? Diluted it may probably have a useful function. I moved into a new apartment . Hers died and mine in still going strong. I had to repot mine because it is so big, but I think I may have to do it again. Doug I have had one for years and all I do is give it one glass of water once a week. From what you are saying it is getting too much water. People in the plant business will tell you that people watering too much is what keeps them in business. I have to cut mine about every three years because it reaches my ceiling. Good luck. I just got one of these plants a few months ago and at first it was doing great, now it seems to be having some troubles. I keep it pretty much watered as suggested above. I keep a close watch for bugs and don’t see any but I’m not all to positive of what to look for especially when it comes to spider mites. As of late my plant continues to lighten in color and the leaves get really soft, almost mushy, turn yellow or white and then fall off. I don’t want to loose this plant I enjoy having it very much but I fear unless I can find a way to help it I may loose it. Can anyone help me save my plant? Try to replant it with new soil. Or you can cut the plant on the stock 1 foot under the last leaf and just stick it in moist soil in another pot. The roots from the pot of the old plant will start new growth and will give you separate different plants while keeping the old plant. I hope this helps ive had the same plant for 20 years by cutting it when it gets too tall and replanting. Another thing is make sure you dont have spider mites they are very deadly and hard to get rid of. if you do, the best way to get rid of them is diluted rubbing alcohol. I have had a dumb cane plant for several years,watered it the same and all of a sudden the top dirt got crusty,it acted like it wasnt taking the water and the leaves just started falling off,i started giving it miracle grow plant food ,Ive done it twice so far and cant see much change in it,Im really sad about it because I got it when my mother passed away,any suggestions? re pot it: Take it out of the old pot, gently knock off most of the old dirt being careful not to damage the roots. re pot it in a bigger pot with new soil. It should do well, Good Luck. P.S. I’m not an expert just been growing only this type of plant in my home for the last 15years.